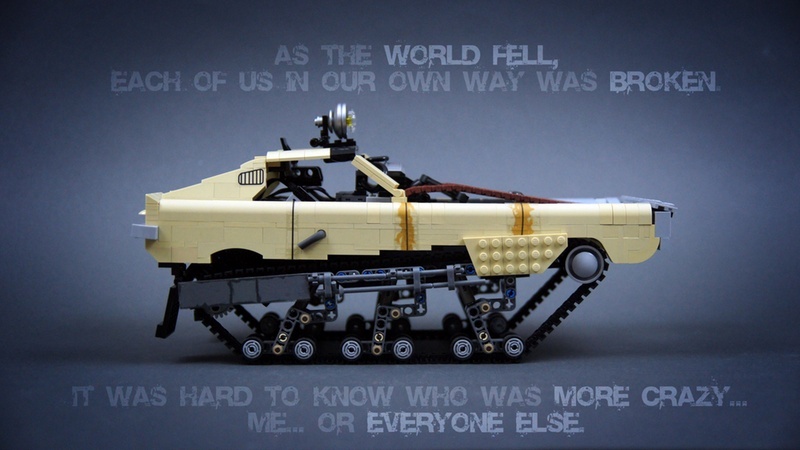 It’s been a while since the last ‘Mad Max – Fury Road’ vehicle featured here at The Lego Car Blog. This means the Elves haven’t watched the movie in ages, seeing as they’re only allowed to do so if they find an appropriate creation. Cue much Elven celebration today therefore, when one of their number returned to the office with this, a rather excellent recreation of the Gigahorse stacked Cadillac from Flickr’s hachiroku24. Not only has hachiroku replicated the movie car brilliantly, he’s also made instructions available so you can build one for yourself. Head over to his photostream via the link above for more. …A road warrior searching for a righteous cause. As the world fell… each of us in our own way was broken. It was hard to know who was more crazy. Me… or everyone else. 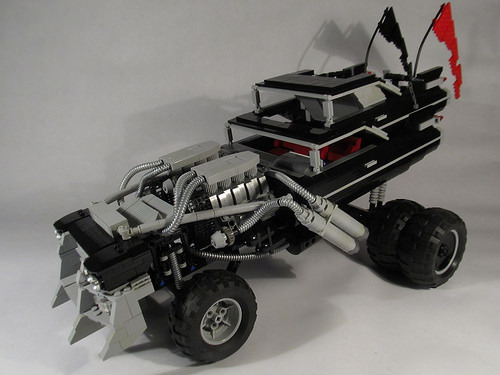 _Tiler returns to The Lego Car Blog with the last of the V8 Interceptors and one of the moodiest shots we’ve published to date. See more on Flickr. There have been three Mad Max movies to date, and with the latest re-ignition of the franchise promising a few more films to come our Elven workforce, whose second love after Megan Fox in Transformers is post-apocalyptic violence, are very excited. The Elf that discovered this photo is something of a hero amongst its colleagues today then, and it has also earned itself three meal tokens. We have seen a couple of these builds from Flickr’s Tim Inman aka rabidnovaracer before, but they look damn cool together don’t they? 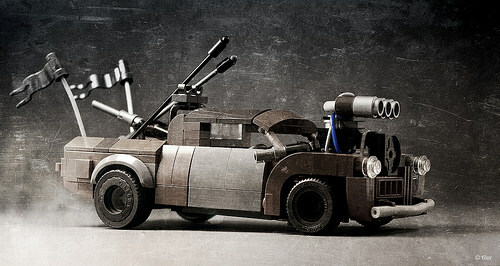 You can see more of his three Mad Max – Fury Road vehicles at his photostream via the link above. It’s (probably) our final MOC of 2015, so it’s somewhat fitting that Tim Inman’s Buick from the latest Mad Max instalment is one of the last vehicles left on earth. There’s more to see of this top-quality build at Tim’s photostream – click here to make the jump and get mad. This insane looking vehicle is – of course – the brutal War Rig from the 2015 movie epic Mad Max – Fury Road. 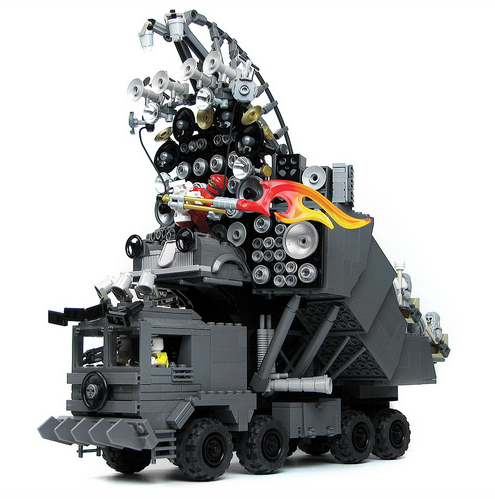 Built by MOCpages’ Desert752 Kirill the War Rig features a multitude of remotely operated functions and, rather than the real truck’s 6×4 drive train, a full 6×6 system. Plus 6-wheel-drive for the trailer. And 4-wheel-drive for the trailer’s trailer. Yup, this marvellous beast has a 16×16 drivetrain, which has got to be a TLCB first. 16×16 is also incredibly effective at squashing TLCB Elves, as many of them discovered today thanks to the delighted Elf at the controls. You can see more of Desert’s incredible build on MOCpages at the link above, plus you can check the Rig out in action via the video below, which is complete with a suitably ridiculous soundtrack. 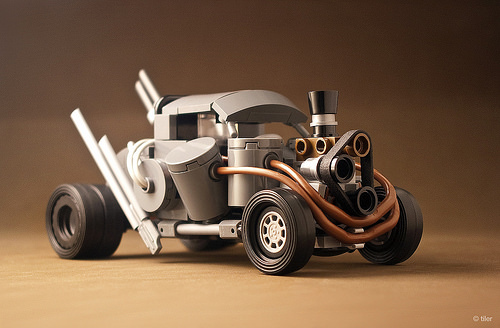 Lego versions of the Mad Max – Fury Road vehicles are appearing e.v.e.r.y.w.h.e.r.e, but we don’t mind – they are the perfect cars for this little corner of the internet. This one comes from Jin Kei, and it’s one of the key cars from the epic post-apoc movie. Join the madness at the link above. This is, quite simply, the most effective Elf-smushing vehicle that has ever graced the halls of TLCB Towers. It’s Sariel‘s incredible newest creation, taken from the equally incredible Mad Max – Fury Road movie, and it’s one of our favourite cars of the year so far. 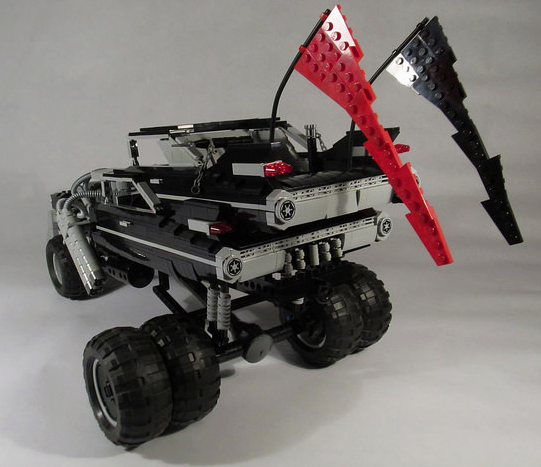 Underneath the ruined muscle car bodywork, and above the brilliant suspended track system, sit a pair of LEGO batteries connected to twin LEGO RC buggy motors, each controlled by the superb SBrick third-party bluetooth system. And that makes the Peacemaker one of the fastest, most agile and most highly manoeuvrable Lego vehicles that this site has ever published. And none of this was good news for our Elves. You can see more of Sariel’s awesome creation on MOCpages by clicking here, you can read more about the builder through our interviews page here, and you can witness the Peacemaker in action via the epic YouTube video below. Following our review of the excellent Manner-Spielzeug Interceptor set from the original 1980s Mad Max movies, we’re back to the 2015 incarnation, with another superb Town-scale recreation from TLCB regular _Tiler. His latest replica is probably the weirdest yet, and you can see more of this and his previous Fury Road vehicles via the link to Flickr above. 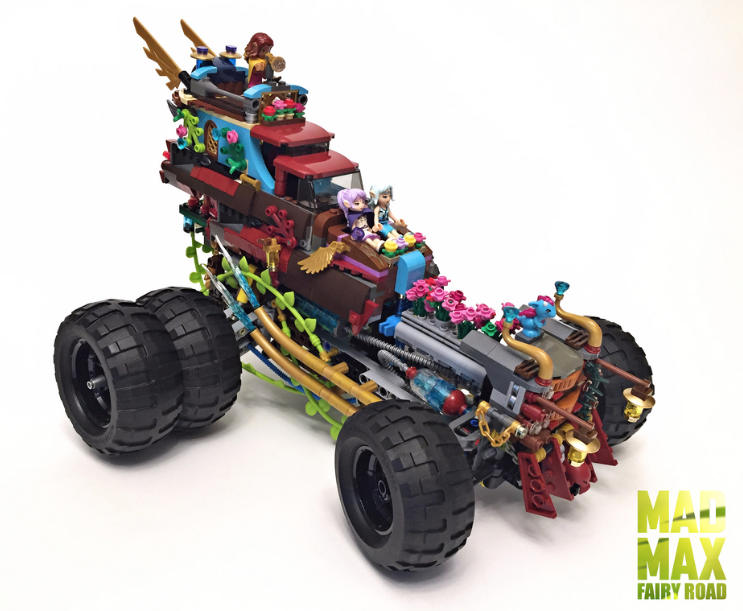 A number of competition entries have been Mad Max or post-apoc related, but this is definitely the first to mix the madness with LEGO’s own recently launched ‘Elves’ theme. In case you’re unsure, LEGO’s Elves are nothing like our own. Like, at all. 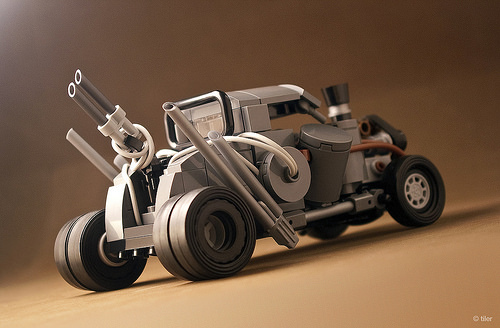 TLCB newcomer Lego Warboys‘ mini-figure scale recreation of the ‘Gigahorse’ from Mad Max – Fury Road is almost everything the Elves could want in a vehicle. The ‘Elven’ iteration on the right is… less so. Oddly though, we think we prefer the pastel coloured flowery version, and it could be the start of a glorious new sub-theme! 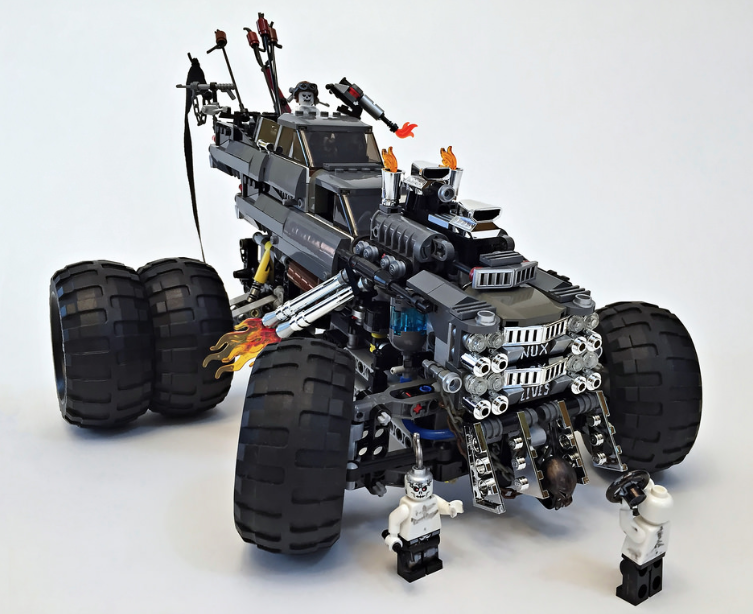 You can see more of both models by visiting Lego Warboys’ Flickr photostream via the link above. The proliferation of vehicles from the Mad Max – Fury Road movie has slowed in recent weeks, but Flickr’s Matt De Lanoy has awakened the theme with a bang today. 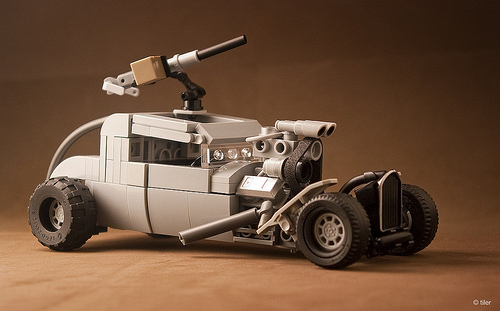 You can see more of his brilliant mini-figure recreation of the Doof Wagon at the link above. 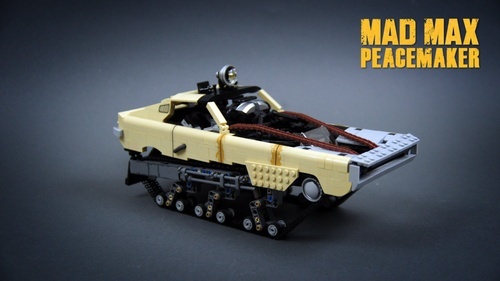 There seems to be little let-up in the proliferation of Mad Max – Fury Road vehicles within the Lego Community, and we couldn’t be more pleased! Flickr’s _Tiler has added another to his garage – you can see more of it and his previous Mad Max builds at the link above. After posting several small scale recreations of the magnificent vehicles from ‘ Mad Max – Fury Road’ we finally have something a little bigger to publish, and what Mad Max vehicle could be better than Immortan Joe’s stacked Cadillac ‘Gigahorse’? Like most of the amazing cars from the blockbuster movie the Gigahorse was made for real. Two 1959 Cadillac DeVille coupes were harvested for their body parts and two supercharged Chevrolet V8s – making a combined 1200bhp – were mounted in parallel up front, channelling that huge power through a custom built gearbox. Terex front loaders provided the rest of the drivetrain whilst 70″ tractor tyres took care of the traction. Tim Inman‘s plastic replica stays as faithful to this set-up as is possible with Lego, and the resultant vehicle is as wonderfully ridiculous as we could have hoped for. There’s lot’s more to see at Tim’s photostream – click the link above to make the jump. 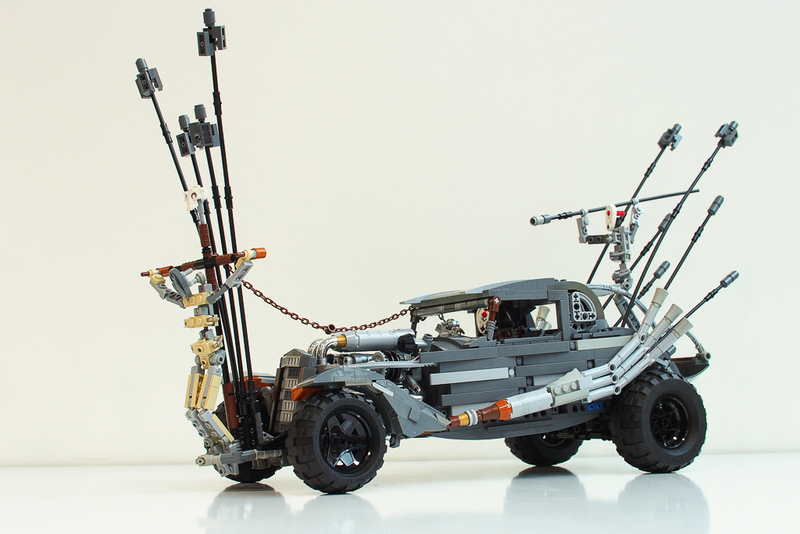 The incredible vehicles of ‘Mad Max – Fury Road’ have taken root in the conscious of the Lego Community of late, which is something we are very much in favour of here at TLCB. Flickr’s _Tiler has added another vehicle from the film – Cranky Frank – to his collection. You can see more of the post-apoc pick-up, as well as his other superb Mad Max vehicles, via the link above.